Hereford Cathedral School's Chapel Choir, one of Herefordshire's largest school choirs, was invited to lead Choral Evensong at St Paul's Cathedral in London. 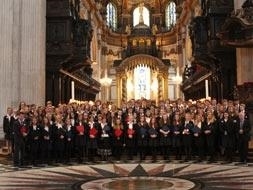 On Monday 21st October 2013, members of the 135 strong school choir travelled St Paul's Cathedral to sing Choral Evensong. The Hereford Cathedral School choir, which comprises of students between the ages of 13 and 18, sang under the School's Director of Music, David Evans, and was accompanied most sensitively by Martyn Lane. David Evans, Hereford Cathedral School's Director of Music, was delighted with the Chapel Choir's performance at St Paul's, and commented on how professional the students were. He said: "We have a large number of performances each year, this term alone there are 28 high profile concerts, but these musicians always stand up to the mark." Next month the School's Chapel Choir will be performing 'Spem in alium', the 40 part motet by Thomas Tallis as part of the Benjamin Britten Centenary Concert at Hereford Cathedral on 22nd November, and the Senior Chamber Choir will be leading Choral Evensong at Oriel College, Oxford on 14th November. Hereford Cathedral School currently runs eight choirs, two orchestras, two concert bands and a host of chamber music. There are 38 Music Scholars at the School and presently the School also has five alumni who are Choral Scholars at Cambridge. Our alumni also boasts a number of notable composers, conductors and musicians. After evensong several Old Herefordians joined Claire Morgan-Jones and The Head, Paul Smith for drinks in the Duke and Duchess, 2 Creed Lane which was a very successful event.